Perler beads are a popular craft supply that can be used to make a number of different designs and patterns when placed carefully on plastic pegboards. By then ironing the beads so that they melt a little bit and stick together, you can easily create fun crafts that work as necklaces, are functional keychains, or can be assembled together to be three-dimensional decor for your home. Part of the fun of working with perler beads is finding fun perler beads designs. The following 15 fun options are sure to give you enjoyment not only while you are working on them, but also when they are completed. Over at Tried & True they have managed to make an incredibly sweet rose tray out of perler beads that is perfect for holding any small pieces of jewelry or other trinkets that you may have in your pockets. This tray makes a great gift for any woman in your life. Not only will using perler beads to cover your earbud cords, such as what they did at Felt Magnet, brighten up the cords and make them more fun, but they will also keep them from kinking and becoming damaged. Choose your favorite colors and patterns for a design you’ll love or use all the colors you have if you want to make sure they will match all of your clothes. Perler beads are perfect for making cute drink coasters, as seen over here on Brit. They look very cute in different designs or with your initial on them. Because they’re fast and easy to make, you can easily mix and match different colors, it’s simple to create coasters that fit with the theme of any party. There are few things more frustrating than a bug getting into your drink while you’re on a picnic. You can help to avoid this problem and enjoy a cut drink cover made out of perler beads. When you follow the instructions at Makezine, choose a fun design or make a cover that looks like citrus fruit for a cute cover everyone will love. Perler beads make perfect buttons, and since you can mix and match the colors you choose, you won’t ever have to worry about whether or not you can find great buttons that will work with your outfit. 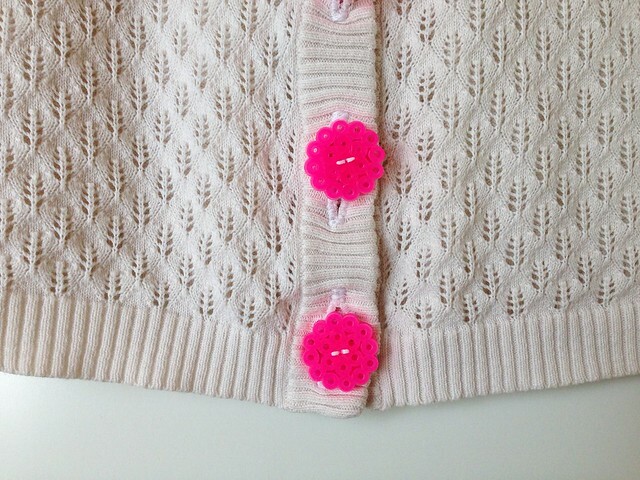 Check them out at Maker Mama and enjoy the fact that they already have button holes included! A keyring is necessary if you want to hang on to your keys, but at My Poppet they make sure that the key rings they make are as cute as they are functional. Pick your favorite fruit and make a keyring that is incredibly cute and a great way to make sure that you don’t ever forget your keys when you head out of the house. Most people love the way that a statement ring can brighten up your outfit, but instead of having to buy one at the store you can easily make one with some perler beads and a ring with pad. Check out what Thirty Handmade Days did and see how they easily turned stray beads into a ring that is cute and fashionable. Over at Panda Hall they took perler beads to the next level and used them to make a three-dimensional box complete with a lid. This is a great place for kids and adults alike to store small items such as rings, change, or other beads. Use a variety of different colors to create a unique box that you’ll love. Skip the boring garden markers and opt for cute ones made out of perler beads so that you don’t ever forget what you have planted. No matter if you have strawberries, tomatoes, or squash, your garden will be cuter than ever when you use perler bead designs for your markers. Check them out on BeadBaby and give it a shot yourself. You want to keep the hair out of your child’s face, and the best way to do that is by using hair clips that they’ll leave in. Rather than fighting over what hair clips you will use, when you make some that are a favorite color or design you can be sure they’ll be a hit. Check out Panda Hall for more. Most kids love to dress up, and if you want to provide your child with fun accessories, then it’s a good idea to turn to your perler beads for help and inspiration. It’s easy to use them to make fast and fun glasses that won’t help you read or protect you from the sun, but will make you look cooler. See the craft at Krysanthe. At Keep Calm and Mommy On, perler beads are used to make cute and fun magnets that will hold everything in place on the refrigerator. No matter if you want to make your own design or choose a funny shape or face, perler beads make cute magnets. Show your Christmas spirit with a small perler bead Christmas tree that will fit perfectly on your desk. This three-dimensional Christmas tree is a little more difficult than some other designs, but it is worth the effort and comes together quickly, as shown over on Panda Hall. Buying new jewelry can get really expensive, but when you use perler beads you can easily make your own. This is a great way to make sure that your jewelry always matches your outfit, as shown on Crafted Sparrow. No matter if you want to iron your beads together or string them on a necklace, this is a fun and fast way to perk up your outfit. Skip the iron, like the team did at Craft and Creativity, and instead string together your perler beads to make intricate chunky cuffs. These are a great way to ensure that you always have jewelry that matches your outfit. With so many fun perler bead patterns and designs to choose from, it may be difficult to pick just one, so it’s time to get to beading!